Learning web designing is very easy and it can be fun in many ways. Moreover, web designing can have many opportunities in store. The main challenge for any web designer is learning web designer interview questions, succeeding in company placements and getting a job. If that individual has the capability to pass the web design interview then there is no stopping for the individual to be a Web Design Expert. Web designing is a creative, engaging and an innovative job. The most important part is having that creative curve mindset, that helps you do your job well. The difficulty which arises is at the time of getting an entry in a reputed company. The basic process is the interview in which you will be asked a question relating to your niche and best way to get through it is nothing but proper research and good preparation. As a step for preparation, having a good look at all the common interview questions for web designing will really help you. A web design can be defined as a process in which a web layout is imagined, planned and finally created in the form of electronic files that help to direct the proper color, fonts, images and graphics together in a interactive yet attractive web format. 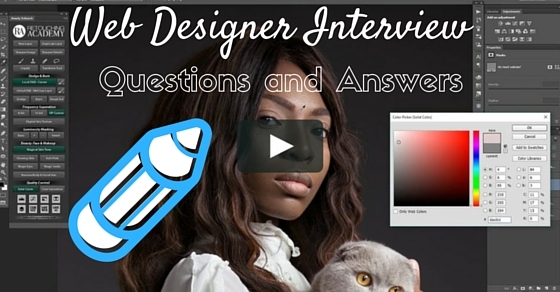 The following mentioned are few tips on how to interview a web designer by using and asking these interview questions. 1. What is a CSS file? For what purpose it is used? Ans: CSS is called as “cascading style sheets”. It is mainly used to open and control web pages. It is usually used for controlling web pages which include font sizes, font styles and colour combinations that is necessary for the webpage. CSS files makes changes globally as any change in a CSS file can also lead to an overall change in the website appearance. This means that any change in a certain CSS file can cause automatic changes to the pages that uses that certain CSS file and will display the changes. Ans: No, CSS is not case sensitive. CSS is case insensitive under most of its control except for document mark-up language which is beyond its control. 3. What is external style sheet? How can we link it? 4. How do I make a webpage that someone can simply just send me a mail by just clicking on text with subject? 5. How to align pictures so that they are one above the other? Ans: By using the align statement in the IMG SRC tag. 6. What are the possible values for “position”? Ans: The type of positioning used for the webpages can be determined by using “position” element. These include static, relative, fixed, inherit and absolute. 9. What does the NaN function do? Ans: Return ‘true’ if the argument is not a number. Ans: Since the question contains strings and + sign is usually used for catenation, the answer returned will be 124. Ans: Usually to convert the number in their different bases use the parseInt() function. This function parses a string and returns a function. The first parameter is the number and the second parameter is the base to be changed. For example: to covert a hexadecimal number to a decimal number we use this function as (“3F”, 16). Ans: A prompt box is a pop up box that allows the user to enter the required inputs. This is done by providing a text box. The prompt box can also have the OK and the cancel button to proceed with the input entered so as to execute the action. 13. What is the basic difference between an alert box and a confirm box? Ans: An alert box is a pop up box that has only one element. That is the OK button. While the confirm box has two buttons the OK and the cancel button. 14. What is the work area in Photoshop? This is where the user can select most of the functions and commands and features in the Photoshop. This is the area where the image to be worked upon appears in the Photoshop. Shows a wide array of different tools. This contains specific features that can change the tools used. This changes the properties of tools as each option is selected. Tools for creating different images can be selected from this function. This is basically a tool box for different tools available. To modify and manage different images available. There are five variations of palettes available in Photoshop. Used to organize different palettes while working or doing a project. 15. What is the difference between HTML5 and HTML? Ans: HTML5 is the newer version of the basic HTML that includes various other properties such as placeholder, video and audio modifications, canvas, 2d and 3d images, date select function and also an added local SQL database. This also enables the webpage to reduce the use of external plugins such as Flash players or any other libraries. 16. What is <!DOCTYPE>? Why is it necessary to use in HTML5? Ans: The <!doctype> is an element used to indicate what type and version of HTML is been used. <!doctype> is usually initialised under the <html> tag. This also does not have an end element and is not case sensitive. The <!doctype> is more important in older versions of HTML, such as the version 4.0.1 since indicating the <!doctype> helped in the process of document type definition (DTD). This is because HTML 4.0.1 was based on standard generalised markup language (SGML). This is not the same case as for HTML5 since that is not dependent on SGML and hence no data type definition is required. Hence, in HTML5 it is not necessary to indicate <!doctype> at the beginning. 17. How many markup elements do you know used in HTML5? <article>: Specifies the self-contained and independent content. This includes a news article, a blog post, a forum post and other elements that could be used to share and distribute from the rest of the site. <aside>: Used to indicate the aside content from the main content. The aside content should be related to the outside content. <bdi> : For elements that should not be bounded by the text direction of the parent elements . <command>: A checkbox, a radio button, or just a simple button can be used as a command. <details>: To describe the details about the document and parts of the document. <summary>: A caption or a summary inside the details of the document or parts of the document. <figure>: For grouping a section or a stand-alone part of a web page. This can include an audio or a video. <figcaption>: To edit the caption of the figure selected. Used to give names of the figure selected. <footer>: Found at the end or the bottom of a page of the document. The footer information may include the author information, the page number, the date of the document, the contact information and the copyright information and details. <header>: Found at the top of the webpage could include various buttons like navigation and also information about the website. <hgroup>: Used to set the heading size of the webpage. The largest id for the main heading while the rest are all sub headings. The heading size varies from <h1> to <h6>. This constitutes the hgroup. <mark>: Used for texts that should be highlighted. <meter>: Used for measurement purposes. Also done when the maximum and minimum values are known. <progress>: To state the work progress of a webpage. <ruby>: For ruby annotations or for foreign languages and their symbols. <section>: For a section in the document. This includes headers, footers, chapters or any other subsections of the document. <time>: For defining the date, time or both. <wbr>: For depicting word break or for the areas where there is a new line or a paragraph. 18. What are the new media elements that are included in HTML5? Why is canvas used in HTML? <audio>: For multimedia contents, sounds, music, and other types of audio streams. <video> : For multimedia contents that include video clips, movies or any other types of video streams. <source>: To define the media sources of various media elements that are defined inside the webpage as audio and video media. <track>: To define the text tracks that are used in different media players such as mp3 players. <canvas>: We can use canvas element in HTML so as to add various elements together. 19. What is the use of local storage in HTML5? Ans: Before the coming of HTML5, the local storage was used to be associated with cookies. Cookies was not really beneficial for usages that include a large amount of data. This was passed on from server to server and hence resulted in very slow and ineffective website performance. This is not the same case in HTML5 as data is not passed in every subsequent server and is used only when asked. Hence, it can be possible to store large amounts of data by itself and still do not affect the website’s performance. Such data is stored in different areas of the website and the website can access most of the data stored by itself. 20. What is the basic difference between HTML elements and tags? Ans: The main difference between HTML elements and HTML tags is that elements are used to communicate with the website on how to render the information. They are represented within <>, these form the HTML tags. Tags usually come in pairs and surround text. 21. What are the limitations seen when serving XHTML servers? Ans: One of the biggest drawback is the poor browser support that the XHTML provides. Internet explorer and various other browsers cannot parse XHTML as XML. Thus, it is not as extensible as it was promised to be. There can also be a large number of other drawbacks. You can also define those problems. 22. What is the difference between standard modes and quirk modes? Ans: Quirks mode is a defined compatibility mode that is different from browser to browser and usually does not promise efficient use of the browser. Standard mode is something that is defined by user and the behaviour is as shown by the CSS and HTML specifications. 23. How many HTML tags should be used for the most simplest of webpages? Ans: It is one of the basic question from web designer interview questions.The simplest of webpages should contain 8 tags, in pairs of 4. 24. What is the difference between linking to an image, a website and an email address? Ans: To link an image you use the <img> tags. In this, the user has to define the image source and its attributes through the src tag. For hyper-texting or for linking the different parts of the website, using <a> which is also called as the anchor tag. The link is usually specified in the href attribute. Href attribute is also called as hypertext reference and is used to refer the formed link back to the original source. The text to be linked should be placed in between the anchor tags. For example: <a> text linked <a>.